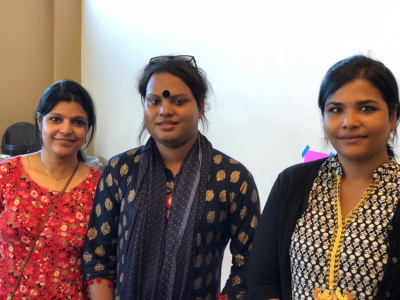 After delivering a keynote address filled with fire as well as compassion, keynote Speaker at the AID 2018 conference held in Portland, Oregon, Sumi Das took some time to chat with AID volunteers Ramya Kumaradhev and Indrayani Maiti about her work and thoughts about life. Ramya interviewed Ms. Das and Indrayani translated. “Hi Sumi thank you for doing this interview with us. It’s been wonderful hearing you speak today at the conference”. So, Sumi Ji can you please tell me from your perspective, what are the 3 things that all human beings are running towards? According to me, everyone in this world run behind… Employment … job… money. This according to me is the number one thing that the society is running towards. 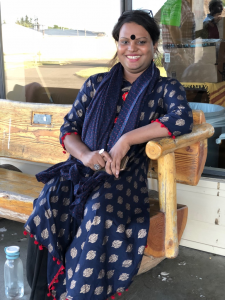 Third thing, I have to think a bit… I am not sure I can speak for other human beings, but for Hijras like us, the third thing they run towards is Power. This is because, we are a very oppressed community and its very desirable to acquire that power. By power I mean becoming a guru. Guru: in the hijra community they have a hierarchy system of guru and follower. Guru is supposedly a powerful position to be in in the hijra community. You have struggled a lot in your life, what made you think you could make a difference in the community? From 2006 I was involved in this movement. People from my community are not respected, I wanted to speak for those who couldn’t speak for themselves. I wanted to break the myth around transgenders, and I started the transgender movement. I believed I could bring a change in their lives so they can earn respect. Personally, what are your strengths? If there is one person you are thankful to in your life… who is it? My friend Pinky who supported me when I first came out of the house. I was 14 years old when I moved out of my house. She was my only friend who supported me a lot. Because of her only I am what I am today. Who was the first person who believed in you that you could make a difference? When I started the movement for a cause Jyotsna Didi supported me a lot. I got to know her from my workplace. Jyotsna is another Hijra and she supported me and believed that I could help our community. I was working in one of the HIV awareness organizations. Any specific incident in your life that broke you down but you again got up to fight back? One night one of my friends knocked my door… She told me that her parents took her to a psychiatrist and made her get electric shock to make her understand that she is a boy. I was shocked when I heard this, I realized that there is nowhere to go and I pulled my self together and decided to fight. 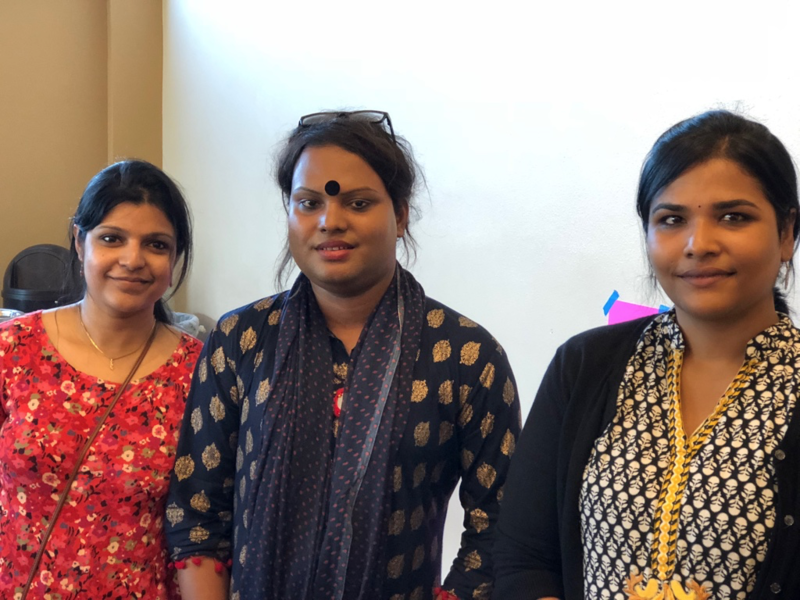 AID is helping empower the transgender community but do you think AID should focus on the rest of the society that is the biggest contributor to the stigma? In West Bengal AID has already started creating awareness for the bulk of the people. I was also a person bringing this awareness… This conference is in itself is a proof that the awareness is created for the larger society. Why else will I be brought here and made to speak in such gatherings. I am sure AID works with my community and society in general. In the past 10 years how has the growth curve been for the community? 10 years back when I used to walk down the road people used to glare at me. They used to taunt me that I was different. 10 years back the transgender word wasn’t there. Now people know there is a community called transgender and they know how to fight for themselves. And they don’t have to define their rights. I wouldn’t have imagined that I would come to the US and create an impact. Such changes were unthinkable 10 years back. I know transgender rights is number 1 for you. Besides these what other causes are closest to your heart? If I keep transgender rights aside, I would fight for underprivileged society, create a mass movement and fight for equality and everything. Dalits in India are being oppressed. I will stand up and fight for them. How do you keep yourself aware of happenings around? I keep myself updated by social media sites, I myself used to work in a political team and after that I left that. It’s not that I always think about myself. But I keep myself updated about all issues happening in this country. I read newspapers but sometimes, the info is not authentic. I check both social media and newspapers and keep myself updated. Is social media effective or in person communication a better means for creating an impact? I think that social media is a far better platform for me. If I post something, I get likes in a few minutes or more comments. But if go in person and meet the person. They won’t like to meet me every time and they will not be able to spare time that frequently. How do you measure response through social media? Do you think likes and comments make a difference? I think social media is a good platform. It’s not only for likes or comments. People like to meet me through that. It’s a fast medium. Rather than meeting them in public I can get their immediate response or opinion through social media. I am able to connect with them instantly. It wasn’t like this 10 years back. Have you tried Facebook live feature? No … I haven’t tried that yet. I like reading autobiographies of Taslima Nasrin and Mahasweta Devi. Generally, I prefer reading auto biographies and sometimes I like reading histories. I like reading histories of many movements that have occurred like Russian movement, movement of black people…Recent issues with Dalits and I have been trying to read their movement as well. In an alternate universe. What would your ideal life have been? I think there is nothing such as an ideal life for me. If there would have been, I myself wouldn’t have supported an ideal life. If there is life, there would be problems, and we will find solution to those problems and I am happy being like that. I like to keep finding solutions for problems. I don’t think an ideal life would be real. What are your experiences of the conference.? I think that I am very satisfied with this conference and have got a platform to express my issues. The volunteers here are not only volunteers, they have a great connection between themselves. They interact like friends. I think that if you work as friends, it’s easier to handle the problems, rather than acting as colleagues. I don’t see this back in India. It could be because its US. But I haven’t seen such a bonding with NGOs back in India. They come from different states working for the cause but haven’t seen such a bonding. What I like here is the humility of the AID volunteers and that has amazed me a lot. They have given me high class stay and facilities and all but are very humble and down to earth. They interact very well and have taken good care of me. I am very happy to be here. Thank you, Sumi ji… with this my questions are complete. Can I take a picture of you?